So, Defra have decided to continue the prevention order until February 28th, which would be in total 12 weeks. I guess their decision was based on the fact that after 12 weeks free range chickens that have been cooped up can no longer be called free range, so large compensation claims after that date! However with the outbreak of bird flu at a backyard keeper in Wales last week does mean bird flu is a very real threat – France are currently culling 800,000 ducks in the south-west of their country, and Holland are considering banning free range chickens entirely. It’s a flu with no vaccine, and no cure so drastic measures only I am afraid. We have kept our chickens in a fruit cage we built when we moved here – its big and we surrounded it with wire so it was secure. However a previous owner had laid down an all weather horse exercise are which in effect meant burying a thick cloth with sand on top over the field. This, and a mystery hump, made making the chicken cage difficult and we never really got it properly right. 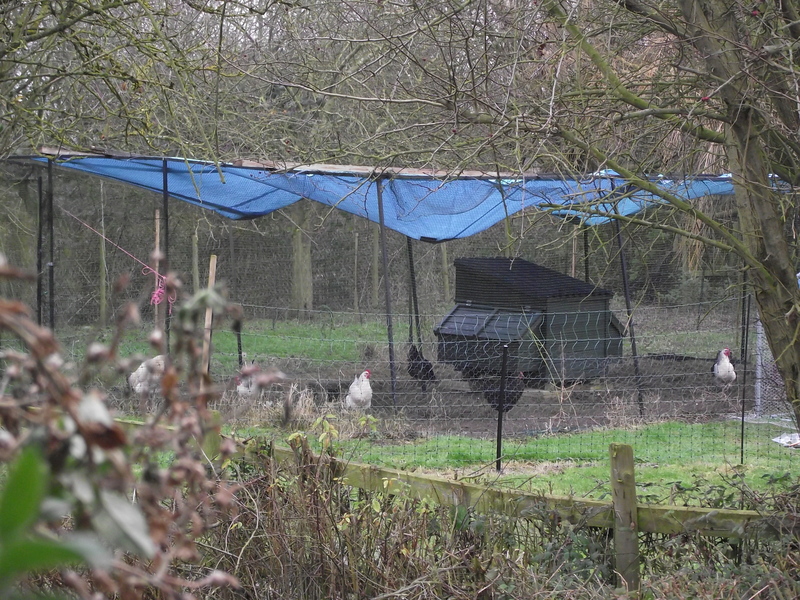 With the requirement to cover all birds and cut out any contact with wild birds we put some tarpaulins over the top – as you can see with a bit of rain and wind the whole edifice has started to fail. Now I am really keen the chickens stay out – with the constrictions but at least they still get fresh air, sun and wind – to be locked in a stall would drive them mad. 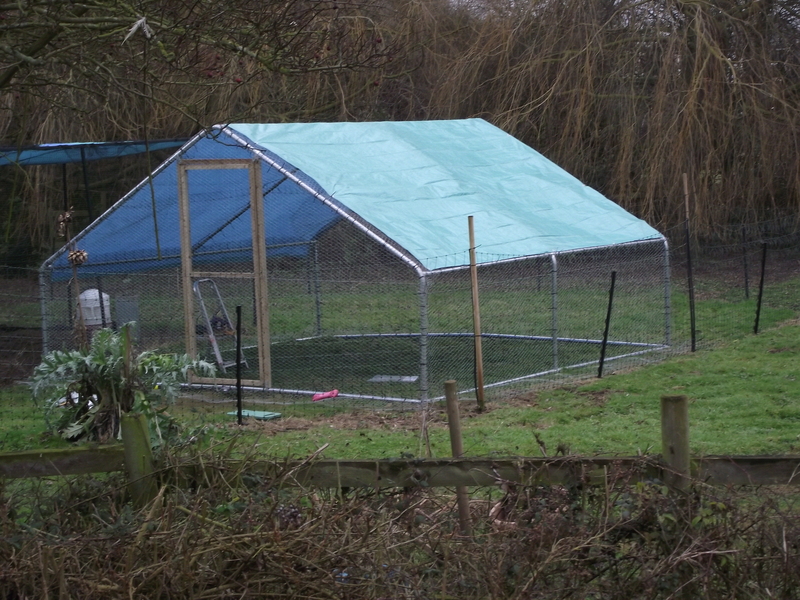 Over Christmas we bought a new, sloped roof enclosure and in the last week we have been building it. its smaller but stronger, and with its sloped roof rain and wind will not be a problem now, and its entirely surrounded with mesh. All we need to do now it take the old enclosure down, and put this one over in its place!!! Easy!!! So tomorrow, before they are let out I am moving the chickens to a stall and plying them with lovely titbits to keep them happy for the day. When they are safely there the old enclosure is going to be dismantled and the new one manhandled into place – and then after the chickens have roosted I will move them back to their coop and they will wake up Sunday in the new enclosure. Well, that’s the plan…….. The geese however still have to suffer their internment in a stall……..only another 7 weeks!! Thanks. We got the birds out at dawn and moved to the stall. A quick breakfast and we started to dismantle the old pen and move the new one onto the spot – then moved the birds back. All done by 12 noon. Birds are happy, and the bird flu prevention conditions met, just been to purchase some paving slabs and need to tidy up the wire around the pen and clear up the old pen debris and all sorted. Much easier then anticipated!! !